Not all business relationships have as happy an ending or make-up. Whether you’re the founder of a large LLC, a minor shareholder, and/or a managing partner within the company, you’re sure to find that there’s always going to be some concern about the efficacy of certain business dealings by your business partners. A lot of times, it’s family or a long-time friend that becomes a business partners. Or, the partner could start out seeming like a cordial and completely likeable and professional person. But, after some time has passed, there may come a day when a line gets drawn in the sand, so to speak, and you are completely on opposite sides of a very important business decision. Or, you can no longer see eye-to-eye as partners. What then? Well, let’s explore the options, shall we. Make accurate, dated, and detailed notes about the situation and capture it in journal form. This information will serve as the basis for an internal investigation. A thorough review of business transactions, records, and financials should also be conducted. If you find any signs of impropriety during your investigation, then it is best to immediate contact a Greenwood Village business lawyer. This legal advocate can help you take the necessary steps to resolve the conflict to a mutually beneficial outcome. You will also want to locate and review your business or corporation’s governing documents, such as articles of incorporation, shareholder’s agreements, non-disclosure agreements, bylaws, etc. 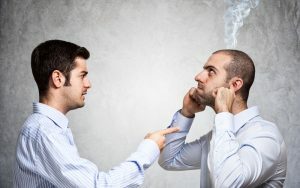 Chances are you’ve probably formed a tight relationship with your partner, or they may in fact be a relative, but either way a business divorce can take a toll on your mentally, physically, and emotionally. This may require seeking additional counseling from a professional, who can listen to the details of your separation and help you objectively review your options to make the best life choices going forward. Attempt to make amends with the business partner, if it is found that the relationship is worth salvaging. Begin mediations and negotiations between business attorneys. Seek a majority decision with stake and shareholders for the removal of a business partner. Seek a fair retirement package for your own departure. Plan for bankruptcy proceedings or dissolve the business and liquidate the business assets. Contact a Greenwood Village Business Lawyer at Underhill Law, P.C. If your business partner is acting in bad faith or you find that you can no longer functions as a business partnership, contact a Greenwood Village Business Lawyer at Underhill Law, P.C. as soon as possible. Quick action will help us prepare the best case possible, and provide you the with support you need during a difficult time. To set up a scheduled appointment, call us today at 303-747-6817, or email us using the contact form on this page. 1“GE No Longer Wants a Hasty Divorce from Baker Hughes” published in CNN Money, Feb. 2018.